Karen Fazekas has been working with clients to create tasteful, stylish interiors for over 30 years. 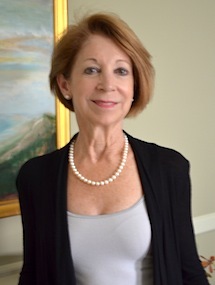 She began her career in the large-scale commercial sector, first designing model apartments for upscale condominium complexes and then renovating five historic properties in downtown Annapolis, Maryland, which encompassed 150 hotel rooms and all public spaces including lobbies, restaurants, and conference rooms. Seeking the intimacy and personal expression of designing for the home, Karen transitioned her business to residential clients while developing her expertise in paint and color as the interior design consultant at Chesapeake Paints and Regal Paints in Maryland. Her experience with hundreds of clients — all with diverse tastes and needs — has given her a comprehensive knowledge and appreciation of the aesthetic and psychological importance of color. Karen graduated from the International Institute of Interior Design in Washington D.C., where she studied the principles of space, aesthetics, and color. She continues to live in Annapolis and serves clients in Washington D.C., Maryland and northern Virginia. Email karen@fazekasinteriors.com for more information or to schedule a design consultation.